It’d be easy to assume that failure is not an option for Mark Richards. Profiled in Professional BoatBuilder No. 165 (February/March 2017), Richards has become famous in his native Australia as the champion skipper of Wild Oats XI. He’s also a successful boatbuilder, and was named CEO of Grand Banks, after that company bought his well-known production brand, Palm Beach Yachts, in 2014. 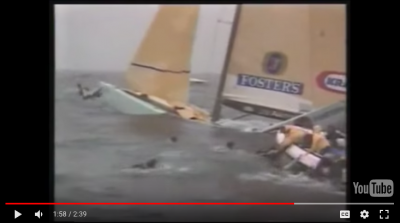 In this video screenshot, Mark Richards can be seen jumping off the bow with another crew member just seconds before the boat sank. But as Steve D’Antonio points out in his story, “The Competitor,” successful people learn from their failures. And Richards’s was pretty spectacular. Working primarily as a professional racer in his 20s, he was onboard One Australia for the 1995 America’s Cup. In that race, she became infamous as the first boat to sink in an America‘s Cup match, breaking in two and disappearing under the waves in under three minutes. Looking at what Richards has accomplished since then, it’d be tempting to make the sinking into a chapter in a book about successful leadership—or perhaps an inspirational TED talk. Richards, however, told D’Antonio that he doesn’t think about the sinking unless someone else brings it up. Read the rest of the story in PBB No. 165, beginning on page 36.